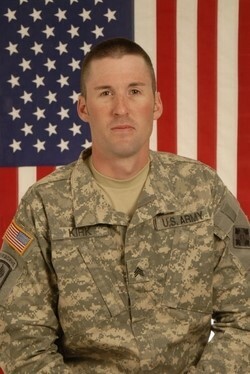 Army Sergeant Joshua J. Kirk, 30, of Colorado Springs, Colorado was assigned to the 3rd Squadron, 61st Cavalry Regiment, 4th Brigade Combat Team, 4th Infantry Division, Fort Carson, Colorado. SGT Kirk was serving as a cavalry scout in Afghanistan under Operation Enduring Freedom when on October 3, 2009 he and seven other servicemen died when enemy forces attacked their contingency outpost with small arms fire and rocket-propelled grenades. Joshua Kirk attended Camden Hills Regional High School and Southern Maine Community College. He enlisted in the Army in 2005. SGT Kirk served two tours in Afghanistan. SGT Kirk believed what he was fighting for and was a highly decorated soldier. “He was helping to make a difference when he was taken from us,” Maj Dan Chandler said. SGT Kirk’s daughter is the recipient of the Folds of Honor Scholarship.